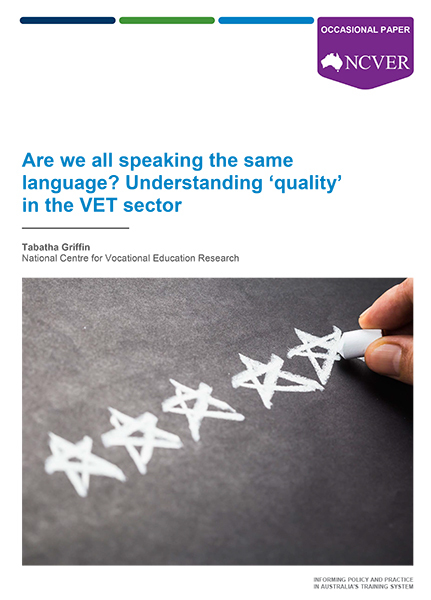 Quality in the vocational education and training (VET) sector is an ongoing area of interest — but what does 'quality' really mean? This paper examines what quality in VET might mean from the perspectives of five key stakeholder groups: learners, employers/industry, providers, government and regulators. The research found that while there are some differences in what is important to each of the stakeholder groups, underpinning all the views is an expectation that learners gain the expected skills from their training. The paper also explores how useful any currently available measures of quality are and how they might be improved. A companion piece to this research Factors that drive RTO performance: an overview by Josie Misko explores the drivers of RTO performance and discusses findings from available literature from Australia and from overseas. It also suggests some implications for further research. A copy of the companion piece is available for download below. Quality in VET is a perennial topic of interest, attracting much attention from participants, providers, funders, regulators and public commentators. Quality is as much subjectively in the ‘eye of the beholder’ as it is objectively assessed through hard data, measures and surveys. This paper summarises the quality of the VET system in Australia from the lens point of the eye of the beholder. It considers the perspectives of five key stakeholder groups: learners, employers/industry, providers, government and regulators. The paper explores, from the perspective of each of these groups, what is important in regards to the VET system, what constitutes and promotes a good-quality VET system, and what are the enablers and barriers to having a system that meets their expectations. The paper then examines the usefulness of the measures of quality currently available, as well as approaches that might be more effective. for providers it is optimal outcomes for all clients, along with provider reputation and viability; and for regulators it is all providers meeting and exceeding national standards. The common ground for all, including for governments and funders, is that learners are provided with the skills they are training for. These multiple perspectives on quality operate at differing levels — at the training program, at employment outcomes and at higher systemic levels. This makes explaining and measuring quality deceptively difficult: it does not simply involve interpretation of data and measures to produce widely available and understood market intelligence. Based on experience and perception, quality is also highly subjective and either drives or erodes reputation and overall trust, at all levels. Effective, fair and prompt regulation is foundational and essential in removing poor quality training from the system. The advice to emerge from the present review of the National Vocational Education and Training Regulator Act 2011 is expected to strengthen this essential cornerstone of VET quality. the complexity of VET market structures, in both providers and training products, which, at a systems level, has the capacity to risk informational, operational and administrative overburden. A companion piece to this paper, Factors that drive RTO performance: an overview, is available under 'Download' as a supporting document. It reviews the substantial work on performance indicators and drivers of registered training organisation performance and suggests areas where future research might be focused.